"Home of the Legion of Valor"
As you enter the foyer from the front of the Fresno Veterans Memorial Auditorium, you enter a marble floored area the size of some banquet halls. The ceilings are art, the walls, the very building itself, all art. Before you is the entrance to the Veterans Memorial Museum the "Home of the Legion of Valor". The Veterans Memorial Museum grew out of the efforts of several dedicated Legion of Valor members and their wives who worked with the City of Fresno to use the Fresno Veterans Memorial Auditorium. Staffed by volunteers and supported in part by the City of Fresno, the museum houses thousands of items and papers donated by Legion of Valor members as well as others. Numerous framed citations, photographs, and exhibits tell the story of America's wars as seen by individual soldiers, sailors, marines and airmen. Uniforms and equipment of different eras are also on display. The Veterans Memorial Museum extends its appreciation to the former Fresno Mayor Jim Patterson, Former Council President Ken Steitz and former Council Members Garry Bredefeld, Tom Boyajian, Chris Mathys, Henry Perea, Dan Ronquillo, and Sal Quintero who is still in office. The Museum is open from 10:00 a.m. to 3:00 p.m. Monday through Saturday. Admission is free to the public. 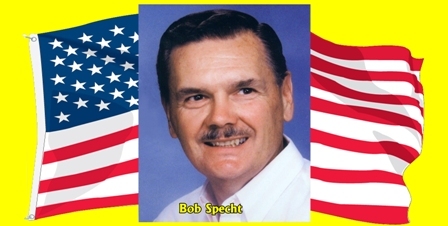 Bob Specht was born April 29, 1936 in the German town area of Fresno, California to parents who were first generation Americans of Russian-German decent. His father Kris, was a brandy maker for the Christian Brothers Wine Company. Bob was literally born with a pencil in his right hand, drawing pictures at a very early age and astounding his mother Edna who often said, "There is no one who is artistic in our family." By the second grade, Bob had attained a 10th grade reading average as he spent most of his time either reading books or drawing pictures. In the 7th grade, his parents enrolled him in an art and cartooning course with the Columbia School of Art that he completed by mail as the school was located in San Francisco. In the 8th grade at Roosevelt High School, Bob took a Couter Career Test that showed his first choice of a career should be a humorist. Cartooning was already his first love, but he never pursued that endeavor. Artists pay at that particular time was paltry, to say the least, but he kept working at his lifelong interest in art. Bob spent 2 years at Fresno State College majoring in of all things, business. He finally decided to pursue a sales career with Drake Steel Supply in Fresno, after befriending the company's office manager Al Fox, whose son was an F-86 jet fighter pilot with the Fresno Air National Guard. The Hayward Air Guard in the Bay Area, had recently been transferred to Fresno, as the valley was a lesser target potential in case of all out nuclear war. At that time, the Air Guard had an ongoing campaign to enlist badly needed personnel to fill their ranks. With the urging of 144th CAMRON First Sergeant Henry Tafoya, in April 1958, Bob enlisted with the California Air National Guard at the Fresno Airport, which was called Hammer Field during World War II, when it was a Black Widow P-61 Bomber base. His first day assignment was to drill 100 other green recruits, like himself, in the art of military marching. Bob began ineptly drilling his fellow recruits out in front of the base hanger as he had been ordered by the busy First Sergeant Tafoya. He mistakenly marched the 100 recruits in front of several "Hot Gun" aircraft whose weapons were fully loaded and parked on the tarmac for immediate take off, in case of an emergency attack. All hell broke loose as aircraft technicians came running out of the hanger yelling to get those people out of that dangerous area. Needless to say, Bob was embarrassed but begged off due to his total ignorance of the danger - but the foopaw really caught everyone's attention. Marching drills were permanently moved to another area, away from the main hanger after that incident. Bob spent the last 4 months of 1958 in training at Lackland Air Force Base just outside San Antonio, Texas. He was not required to attend a technical school, after passing a battery of tests that showed, he did not need training as a photo mapping specialist that was his Air National Guard career choice. Bob had learned Aviation Drawing while a senior at Theodore Roosevelt High School from a former military officer Captain Charles Furby. There were only 2 students enrolled in the aviation drafting course, so Bob had a lot of excellent one on one tutoring by his instructor. By the time he graduated from high school, he had 10 semesters of drafting under his belt plus many semesters of traditional art training. Bob became a member of the 144th CAMRON Squadron of the Air Guard and did most of his various types of drawing in the aircraft hanger of the base. Among his achievements, Bob designed a portable radio tower which was used at locations on and off the base, especially during practice alerts. The Fresno Air National Guard Base personnel utilized the tower for many years. It was affectionately called the "Peanut Wagon" by base personnel, due to its unusual appearance, created by the use of angular windows to defect glare away from the tower operators eyes. There were several national crises during Bob's Air Guard career, but the one that is most memorable is the Cuban Missile Crisis during October 1962. The Fresno airbase was placed on 24 hour high alert. Only a few of the "need to know" base personnel were aware of Fresno's war target potential as nuclear weapons were stored in earthen bunkers on the north side of the Fresno Airport in large quantities, and contained vast megatons of explosive power. As we all know, the Russians backed down and shipped their missiles back home, but it was a shaky couple weeks for many Fresno Air National Guardsmen. During his 6 year stint in the Air Guard Bob drafted endless amounts of organizational and functional charts which were used extensively all over the base. He was named FANG Airman of the Month during 1962. Bob's deceased wife Joan, whose father Major Roy A. "Pat" Patterson, was the commander who delivered the first 9 P-38s to the South Pacific Theatre at Henderson Field on Guadalcanal in January, 1943. He was awarded a Distinguished Flying Cross for secretly developing the air route and then leading the P-38s across the Pacific in a B-24 Liberator. Patterson's plaque is in the Veterans Memorial Museum's Lobby of Honor. The Specht's had 3 daughters Vicki, Robin, and Juli who have given them 6 grandchildren and one great grandaughter. Bob worked as manufacturer rep for RCA Whirlpool for many years and opened Clovis Home Furnishing in 1974, operating that business until he retired July 1, 1992. Upon retirement, Bob began doing self - taught digital artwork and video on a Mac computer. It was amazing to him that art and video could now be created electronically. He had one of his videos presented on a CBS network show called "Prime Time for Pets" about a dog named Piston who attempts to drive and fix cars. 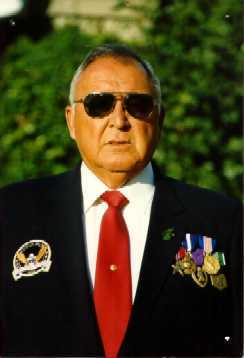 Bob joined the Legion of Valor Museum in April, 2000, and began working with Director Chuck Monges as office manager. An interesting side note, Chuck Monges was employed for several years in the sales department by Bob's younger brother Ken at Liberty Chevrolet in Selma, CA. It's a small world! Upon the passing of Chuck Monges in 2001, Bob became the museum's Deputy Director under Director Art Hill. 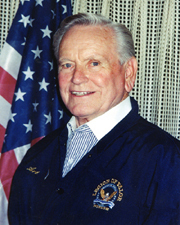 After taking a debilitating fall which ended Mr. Hill's ability to continue, Bob was elected April, 17, 2012 as the Director and CEO of what is now the Veterans Memorial Museum, "Home of the Legion of Valor". Arthur Hill, at age 27, volunteered for the Army Engineers shortly after Pearl Harbor. Because of his construction background, he was sent to Camp Claiborne, Louisiana, early in 1942 to a Special Service Engineer Regiment. On December 23, 1942, Art graduated from O.C.S. and the Heavy Equipment School at Fort Belvoir, Virginia, as a Second Lieutenant. At Camp Swift, Texas, he was assigned to the 146 Engineer (C) Battalion as the Headquarters Company Commander with the additional duty of Battalion Motor Officer. He held this command, as Captain, with various additional duties until war's end. While at England's North Coastal area of Saunton Sands, the battalion helped build and operate an assault training center of enemy fortifications duplicated from secret aerial reconnaissance photos of the landing beaches and Seigfried line defenses. This led to the spearheading of the Omaha Beach "D Day" landings at the "H" hour plus 3 minutes across the English Channel on the 6th of June 1944. The five European campaigns followed; Normandy, Northern France, Rhineland, Ardennes- Alsace, and Central Europe. Following the German collapse, the 146(C) Engineers and other Engineer groups of V Corps, were assisting with the debris clearance and restoration of utilities of battered Pilsen, Czechoslovakia. In Pilsen, Art was named director of the XXII Corps Heavy Equipment School for approximately 65 Czech civil engineers and equipment operators from the V, VII, and XXII Corps. While the U.S. was still at war with Japan, some men were thinking of home; others with fewer points were thinking of their possible transfer to the other side of the world. Art lacked less than one point of the amount required for discharge and was slated as Base Commander at one of several embarkation centers for upgrading facilities for pending troop movements. He was at the Biarritz American University (Engineer school) in Southern France making preparations when he learned that he had received a foreign award, the Czech Military Medal. Now with enough points for discharge, the several jumps in grade no longer enticed him. He returned to Czechoslovakia to say good-bye once again to his fellow officers and troops. Upon returning home, after his January 8, 1946 discharge, Art worked in the petroleum industry for over 30 years. During his semi-retirement years of 1975 - 1979, he served as the nine(9) western states representative on the Shell Oil Company National Jobber Council. He retired in 1980 as President of Hill Oil Company. Art and his wife B.J. (now deceased) were married over fifty years. Veterans Memorial Museum "Home of the Legion of Valor"
For extraordinary heroism in action against enemy forces on Saipan, Marianas Islands, while attached to a Marine rifle company. On 2 July 1944, Sergeant Monges was serving as sergeant guide in the first platoon of his company. Shortly after the company had started to move forward in an attack, his platoon was fired upon from several cleverly concealed enemy gun emplacements which threatened to destroy two squads of the platoon. Sergeant Monges quickly realized the peril in the situation and immediately took action to destroy the ambush. He dragged a seriously wounded automatic rifleman out of the path of fire of an enemy machine gun and into a position where he could be rendered first aid. He then took the automatic rifle himself and, in spite of the intense machine gun and rifle fire from the emplacements, worked his way to a position from which he could deliver devastating fire upon the enemy. With complete disregard for his own safety, he continued to fire upon the Japanese until the other members of his platoon could maneuver into positions to aid him. The platoon quickly took advantage of his splendid example of leadership, and also of the breach which he had created by destroying the nearest machine gun nest, and rapidly annihilated the enemy. The outstanding courage and devotion to duty displayed by Sergeant Monges was highly instrumental in making possible the successful attack against the enemy. His heroic action were in keeping with the highest traditions of the United States Naval Service. The Legion of Valor is one of the two most unusual organizations in the United States. Membership is not achieved by birth, social position, political appointment, wealth, academic achievement or other requirements that most societies and organizations have established for membership qualification. Eligibility is limited to recipients of our nation's two highest decorations for valor. The official presentations of these decorations to members of the Armed Forces in appropriate ceremonies determine who its members will be. The Legion of Valor was organized on April 23, 1890, in Washington, DC, by a group of Civil War and Indian War Campaign veterans who were recipients of the Medal of Honor. At its inception, the name was The Medal of Honor Legion. The membership was augmented following the Spanish Campaign of 1898 and following the Philippines Insurrection. The membership was never large and with the passage of years and subsequent demise of members, on November 25, 1918, the recipients of the Army Distinguished Service Cross, the second ranking Army decoration for extraordinary heroism, were admitted to membership. In 1933, members of the United States Navy and Marine Corps, who were recipients of the Navy Cross, the second ranking Navy decoration for extraordinary heroism, were invited to join the membership and the name of this prestigious organization was changed to The Army and Navy Legion of Valor. On August 4, 1955, Public Law 224, 84th Congress, incorporated The Army and Navy Legion of Valor of the United States. With the creation of the Air Force Medal of Honor and the Air Force Cross, the membership invited the recipients of these medals to become members and on June 21, 1961, with P.L. 87-56, the name of this elite organization became the Legion of Valor of the United States of America, Inc.
Each of the three services has its own distinctive design for the Medal of Honor and the three Crosses. The Medal of Honor is awarded for conspicuous gallantry and intrepidity at the risk of life, above and beyond the call of duty. The three Crosses are awarded for extraordinary heroism. Many of these two highest decorations are awarded posthumously. The Legion of Valor has maintained a consistent interest in recognizing outstanding performance. In 1957, at the 67th National Reunion, the Legion of Valor created a Silver Cross for Heroism and a Bronze Cross for Achievement. In establishing these awards, members of the Legion of Valor concluded that the Silver Cross should be reserved to recognize actions involving the saving or preservation of life and that the decoration could be conferred on any person whose conduct met such standards. On the other hand, the Bronze Cross for Achievement should be available to those cadets of the Reserve Officers Training Corps who have demonstrated excellence in military, scholastic, and civic affairs. The very nature of the Silver Cross for Heroism suggests that it would be given sparingly and only after thorough review by the Legion of Valor Awards Committee. Hence, it is seldom that more than two Crosses are presented in a year's time although there is no limitation on the number that may be granted. While there is no such thing as a typical Silver Cross award, over recent years it has been given to a Florida newspaper carrier, a non-swimmer, who dived into a canal to rescue the driver of a car which had sunk in the water. Another went to a Texas National Guard chaplain, who, though painfully injured, saved a number of elderly persons from drowning when a sudden violent thunderstorm struck over a lake where people were boating and bathing. A Silver Cross for Heroism was posthumously presented to a native of Mexico who was studying for his U.S. citizenship examinations. When his tutor was attacked by six assailants, he went to her rescue, beat off the attackers, but suffered gunshot wounds which cost him his life. Two more Crosses were given to recognize the valor of two airline pilots who successfully thwarted a hijacker. Although one pilot was killed and the other wounded, the plane was landed successfully after the hijacker was wounded and subdued by the pilots. The Silver Cross for Heroism was awarded to an airline purser, the first ever to a woman, who was credited with saving a sailor's life during a hijacking in Beirut. Most recently, it was presented to a Director of a Veteran's Administration Medical Center who climbed a construction crane to a distance of about 105 feet above the ground to render aid to an apparently suicidal veteran. At the 98th Annual Reunion, the constitution was amended to allow Silver Cross recipients to become associate members. The Bronze Cross for Achievement program began on a limited scale in 1951 when the District of Columbia Chapter established an incentive for excellence in the Washington High School Corps of Cadets. The national body of the Legion of Valor ordained that the program be converted to a nationally-sponsored program in 1957. Thus it was extended to the Fifth U.S. Army in 1959, to the Third U.S. Army in 1960, and in 1961 to all Army ROTC and NDCC cadets. In 1962, college-level cadets of the U.S. Air Force ROTC became eligible to receive the Bronze Cross, and in 1975, college-level midshipmen of the U.S. Navy were given the privilege of competing for the Cross. High school cadets of the Junior U.S. Marine Corps ROTC also participate in the program. Criteria for award of the Bronze Cross for Achievement have been developed by the Legion of Valor in conjunction with officials of the Army's ROTC program. In general, the standards of achievement are similar to the qualities required for award of the Army's Superior Cadet Decoration and have been adopted by the Air Force, Navy, and Marine Corps. Thus, the same standards prevail for all services. Administration of the program is conducted by the services under the aegis of the Legion of Valor. Recommendations are sent to the Awards Chairman of the Legion of Valor who conducts reviews to assure adherence to all criteria, including the rule that the Cross is to be presented for performance through the next-to-last year of school. Because of the rigid standards and the thorough screening processes employed, less than 50 cadets and midshipmen receive Crosses each year. All Crosses and certificates are provided by the Legion of Valor at no cost to the participating services or to the institutions attended by the successful nominees. All nominations originate with the military officials having jurisdiction over the individual being nominated. Presentations are customarily made by an officer or member of the Legion of Valor in conjunction with officials of the institution. The Veterans Memorial Museum "Home of the Legion of Valor" was established August 1, 1991, and incorporated into the Constitution and By-Laws August 21, 1993. Located in Fresno, California and supported heavily by the community, the museum contains military memorabilia, artifacts, photographs, and official citations. Return to the Veterans Memorial Museum homepage.